இத்தளத்தில் உள்ள அனைத்து ஆங்கில இலக்கணப் பாடங்களும் இங்கே இப்பட்டியலில் இடப்பட்டுள்ளன. இனிமேல் புதிதாக வழங்கும் ஆங்கில இலக்கணப் பாடங்களும் இப்பட்டியலில் இடப்படும். ஆங்கில இலக்கணம் கற்போர் எளிதாக இப்பாடங்களை அணுகுவதற்காகவே இவ்வசதி செய்யப்பட்டுள்ளது. குறிப்பு: ஆங்கில இலக்கணம் தவிர்ந்த பாடங்கள் இந்த பட்டியலில் உள்ளடக்கப் படவில்லை. அவற்றை தொடர்புள்ள பட்டியல்களில் பார்க்கவும். மேலே பட்டியல் இடப்பட்டுள்ளவை ஆங்கில இலக்கணப் பாடங்கள் மட்டுமே ஆகும். ஏனையவற்றை கீழுள்ள தலைப்புகளை சொடுக்கி பார்வையிடலாம். பாடங்கள் தொடர்பான ஏதேனும் கேள்விகள் இருந்தால் குறிப்பிட்ட பாடத்தின் கீழ் கேளுங்கள். அதேவேளை அவ்வாறு அல்லாத ஆங்கிலம் தொடர்பான ஏனேனும் கேள்விகள் இருந்தால் ஆங்கிலம் கேள்வி பதில் பகுதியில் கேட்கவும். மேலும் அடிக்கடி கேட்கப்படும் கேள்விகள் பகுதியையும் பார்க்கவும். Really super now i hope will learn english easily & shortly thanks Mr. Arun. Dear sir! When will you update about 'past perfect'? Adjectives,Interjections,Past Perfect Tense,Past Continuous Perfect Tense, Future Perfect Tense, Future Perfect Continuous Tense,Passive Voice, Active vs Passive,+ be form we will like to that moment of read your English explanations. Sir pl send past perfect,future perfect and future pferfect continous lessons. வணக்கம் நண்பரே உங்கள் பாடத் திட்டம் மிகவும் எளிதாக உள்ளது . எனக்கு SHALL மற்றும் WILL , SHOULD மற்றும் WOULD இச் சொற்களுக்கு விளக்கமும், இவற்றை எந்த இடங்களில் உபயோகப்படுத்துவது என்பதை பற்றி கூறவும். hai sir...how can i get below lessons? hi arun , i am unable see past perfect continuous tense,past perfect tense,future perfect tense.kindly help me. Really very useful website for me thank you very very much. Sir please explain when to use " that "
Sir, you explanation really helpful to us. Thank you so much.pl kindly explain the remaining four tense earlier. Sir, you explanation really help to us thankyou so much.pls kindly explain the direct speech and indirect speech pls explain sir. I saw your lessons, It has been very useful to me.thank you for your effectiveness. I am jayaraman from krishnagiri dt, now working to lakshmi Vilas Bank krishnagiri branch this website very better than useful spoken english today any job besice english very much so thankful many friend forward this page. I have a doubt in simple present. What is difference between "I bath, I have a bath" both sentence are giving same meaning. please clear the doubt as soon as possible. Thank you. In present continuous " I am bathing" / "I am having a bath" Why do you join 'ing' with auxiliary verb(have)? your formula is "Subject+Auxiliary verb+ Main verb+ing. I have little confusion with it. please clear it sir. because i am learning grammar through your website for my competitive exam. Thank you. Very nice and more useful. 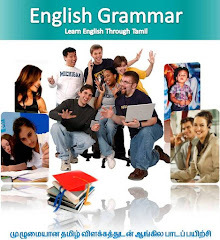 This link more useful for learning of fundamental grammars through Tamil language. Links of Past Perfect, past Perfect continuous, future perfect and future perfect continuous are not accessible. I kindly request to you please add given below listed forms, its may be useful to every one.